I received these products to review. I received three adorable dolls made by Corolle (Babibunny, Sweet Heart Pink and Sweet Heart Toffee Pink). 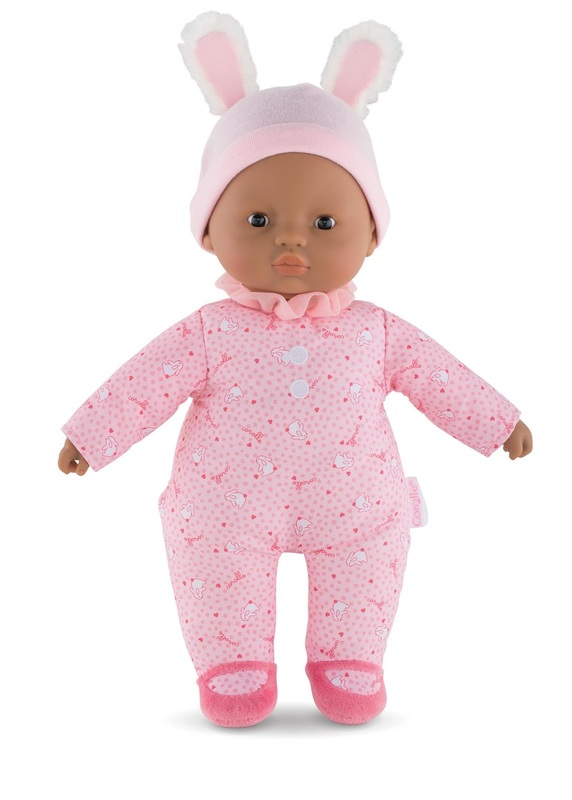 Each doll is 12 inches tall, the perfect size to be cuddled and cradled in a young child's arms. They are designed and styled in France. They feature the signature vanilla scented vinyl hands and face. Each doll has a sewn in label where you can fill in your child's name (or your own as the parent) and phone number. This gives a greater chance of the doll being returned if it is ever lost. 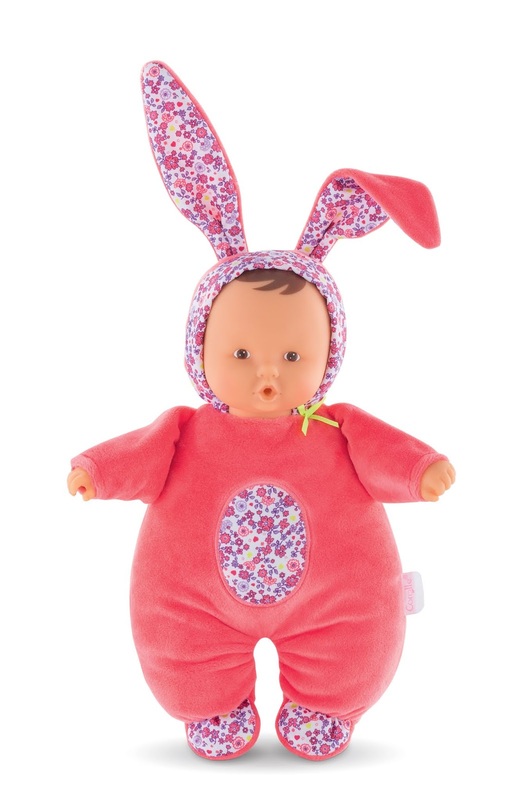 This is the Corolle Mon Doudou Babibunny two in one Musical Baby Doll and Nightlight. She is named Floral Bloom. Her soft design and music makes her perfect for even babies, and the nightlight will give comfort in the night. If she gets dirty, the battery casing can be removed so you can throw her into the washing machine on gentle cycle. You can purchase Floral Bloom on Amazon for $39.97. 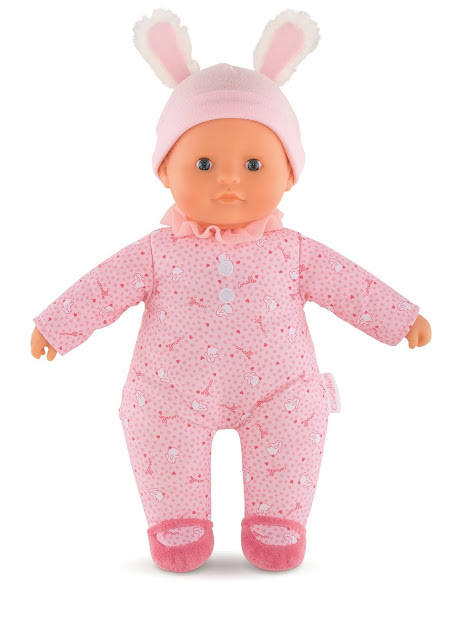 This is the Corolle Mon Premier Poupon Sweet Heart Pink Baby Doll. The hat with the bunny ears can be pulled off of her head, but it is firmly attached to the back of her neck so you don't have to worry about it getting lost. Her sewn on pajamas are made of a variety of materials and textures to encourage and stimulate emerging senses. She has fixed blue eyes and is suitable for ages 9 months and up, and she would be an excellent choice for a first birthday gift. You can purchase her on Amazon for $29.29. This is the Corolle Mon Premier Poupon Sweet Heart Toffee Pink Baby, Doll. Like the Sweet Heart Pink doll, the hat with the bunny ears can be pulled off of her head, but it is firmly attached to the back of the neck to prevent it from getting lost. She also wears sewn on pajamas that are made of a variety of materials and textures and is suitable for ages 9 months and up. This doll has fixed brown eyes instead of blue. You can purchase her on Amazon for $19.99. Next we have three products from Faber-Castell. 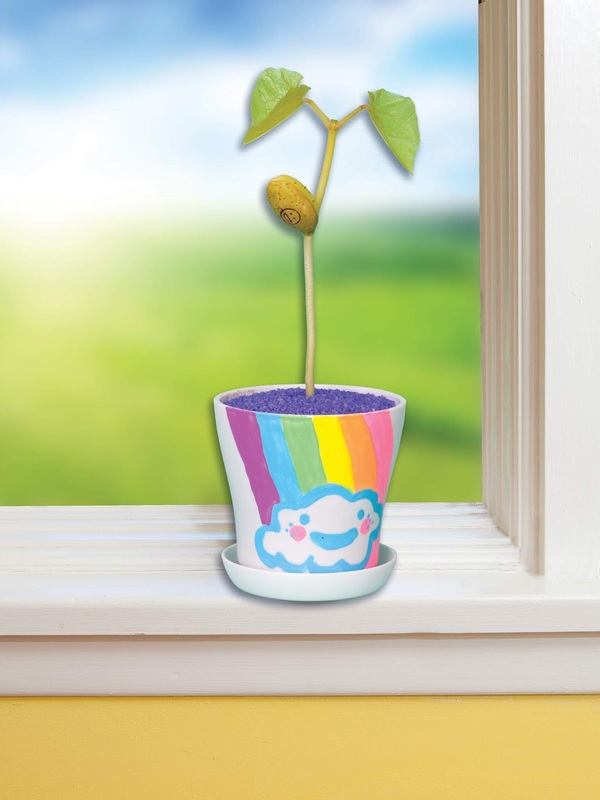 They are the Rainbow Sandland, Rainbow Fluffy Paint and the Magic Bean Garden. 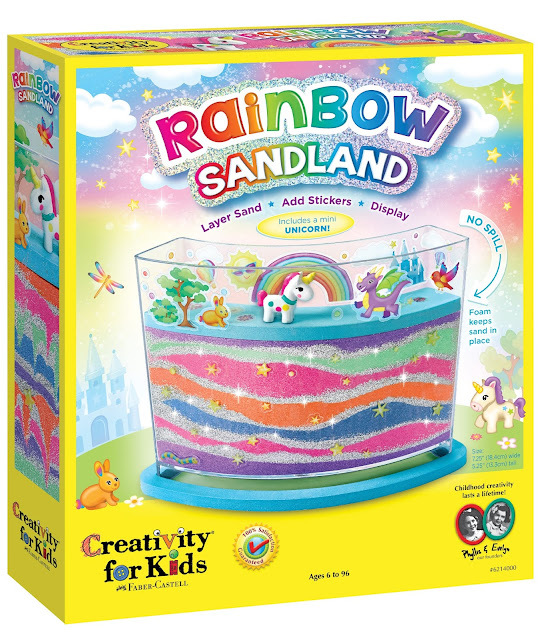 This is Creativity For Kids Rainbow Sandland. 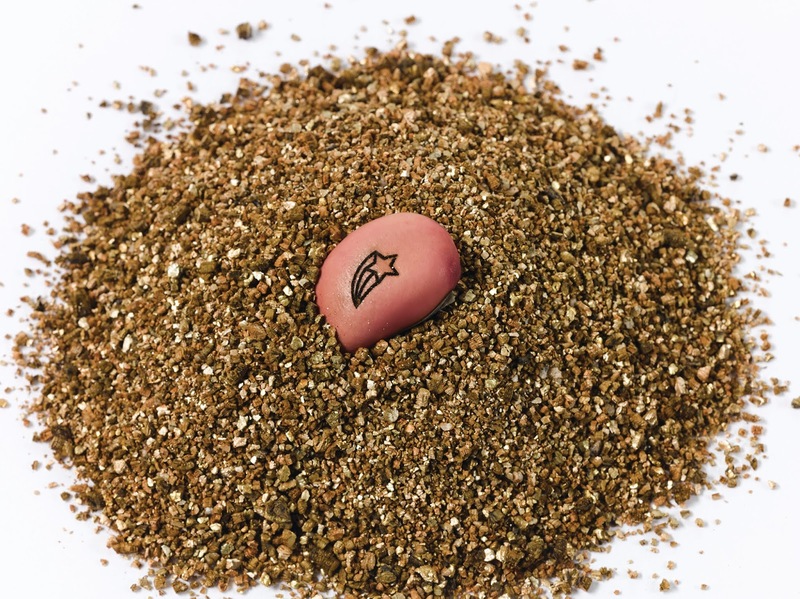 It comes with everything you need to make a beautiful layered sandscape. You get the clear window frame curved container, 5 vibrant colors of sand, glitter, a wooden design tool, stickers, funnel, craft glue, mini unicorn figurine and a fitted cap piece to glue in place above your sand layers. This will hold the sand in place so your design will remain in place and it will prevent the sand from leaking out. 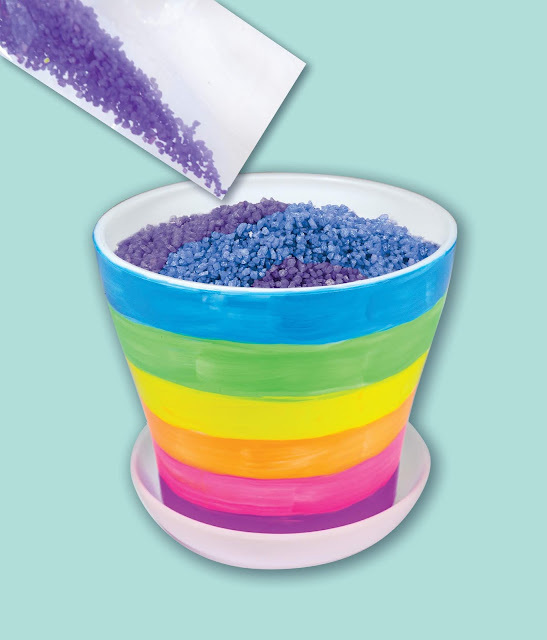 Combine the glitter with the colored sand and layer the colors in the container. Use the design tool to create intricate patterns that are unique to your imagination. Finish off your design using the unicorn figure and the stickers. 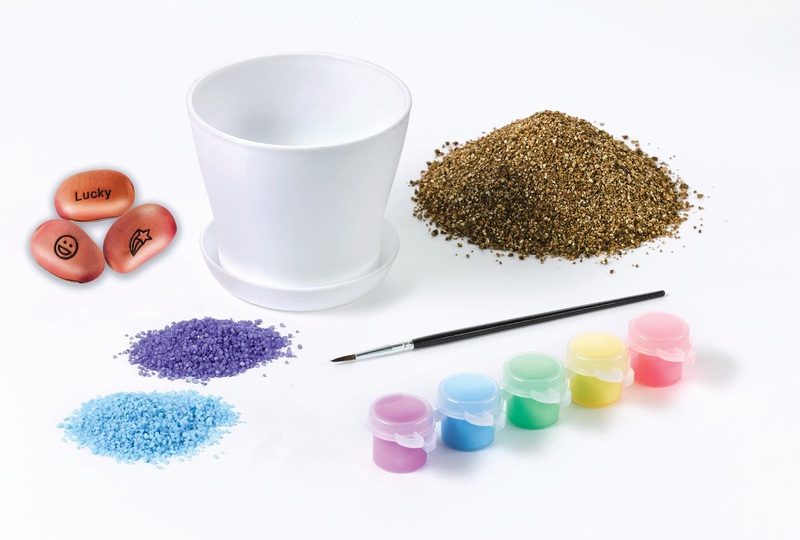 Once you have finished your sand art masterpiece, avoid shaking or tipping it. Even with the cap in place, the sand can still shift and you may lose your intricate patterns that you made with the design tool. So proudly display it on a shelf or table top without tipping it. It is recommended for ages 6 to 96. You can purchase it on Amazon for $15.99. This is Rainbow Fluffy Paint. With a 3D whipped texture, it's like painting with fluffy frosting. You can mix, layer and design in dimension with this fluffy paint. 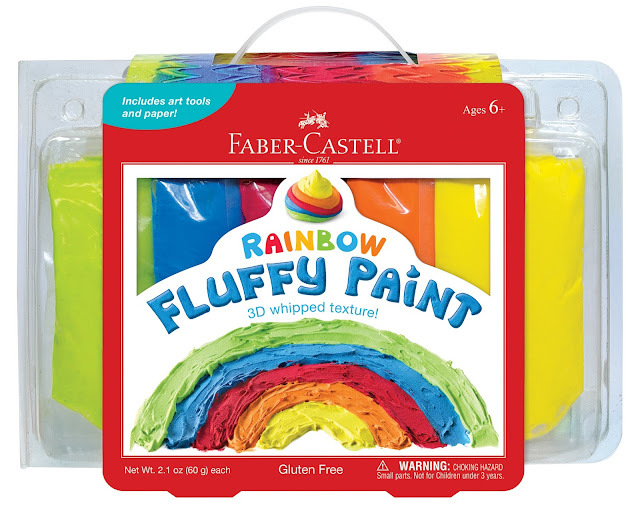 This set includes 5 different colors of fluffy paint in pouches, drawing and mixing tool, texture card, stencil, black papers and white papers. Everything is allergen free and comes in a snap case box with a handle for carrying. Use the texture card to create patterns and the stencil to make 3D dots. use the tools to smear and scratch to make a stunning drawing or blend the paints together to form a rainbow. Use your imagination with your are, that's the funnest part. The paint dries quickly and will hold the 3D effects. Recommended for ages 6 and up. You can purchase this on the Faber-Castell website for $17.99. I saved this one for last because it is so incredibly cool! It's the Magic Bean Garden. 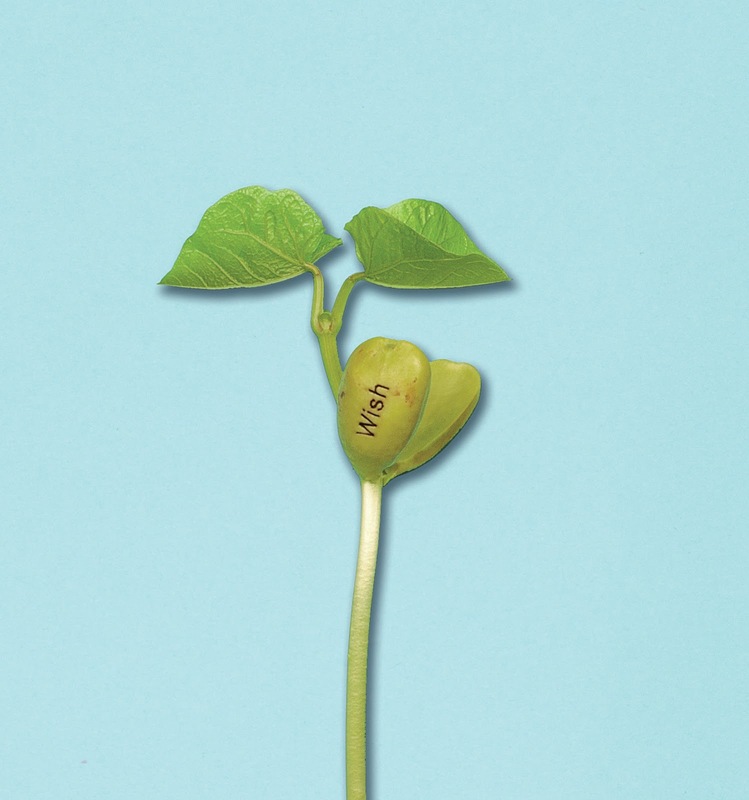 What makes it so cool is that when your plant grows, it will have words or images on it! You get everything you need to grow your own magic beans. You even get supplies to decorate the planter. 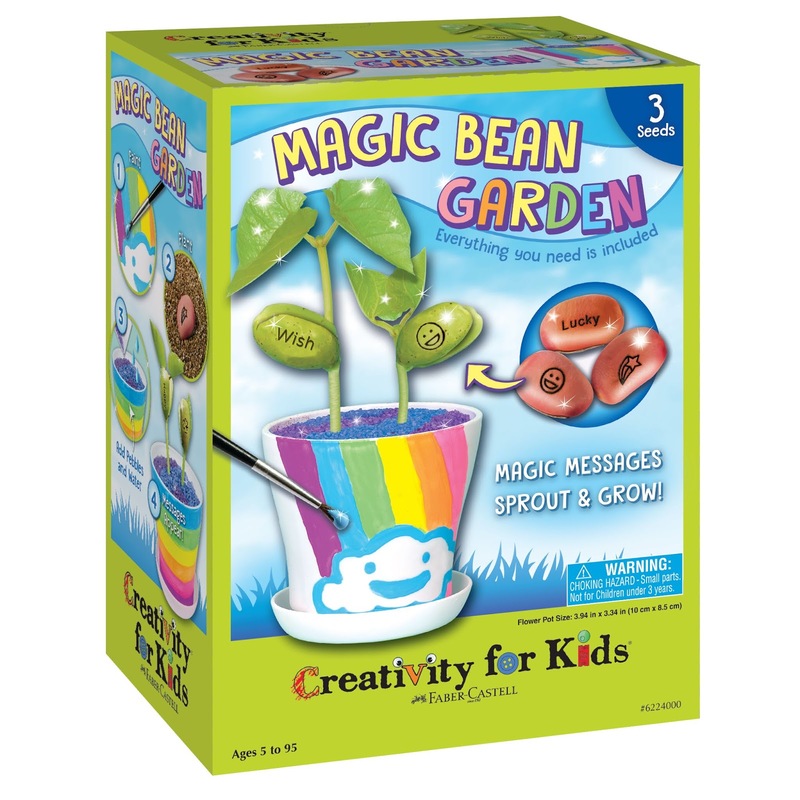 Included in the box is a planter, colored garden stones, potting mix, 5 colors of paint, a paint brush and three double sided magic message beans. First, you paint your planter using your paints. Make sure you spread newspapers over the table surface before you begin and have some water and paper towels handy in case you spill. These acrylics paints will not wash away once it is dry, so clean up any spills immediately while it is still wet. Wear old clothing or an apron because if you get it on your clothes, it will not wash out. Stir your paint thoroughly before using it because it can separate over time. If it seems too thick, add a drop or two of water and mix it in. Make sure you thoroughly rinse out your brush and dry it each time you switch colors, and also when you are finished painting. 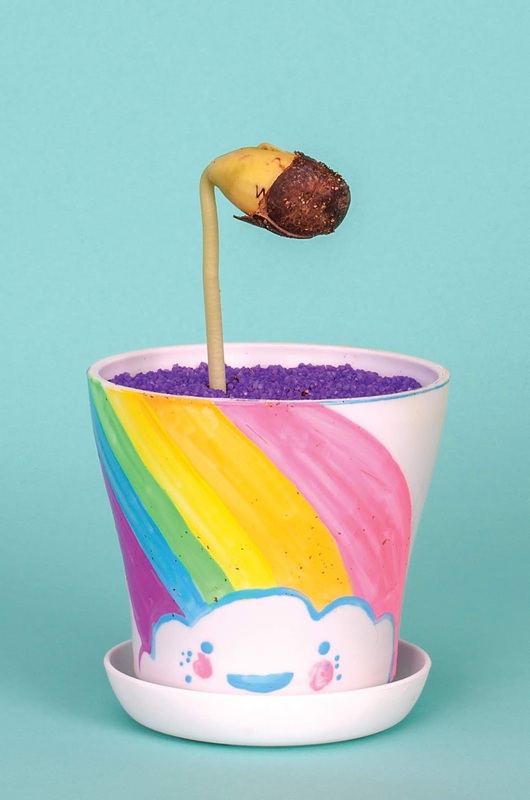 You can use your imagination and paint your planter any way you want to. You can come up with your own design, or look at the package for design ideas. Let the planter dry completely before moving on to the next stage. While your planter is drying, take a look at your beans. 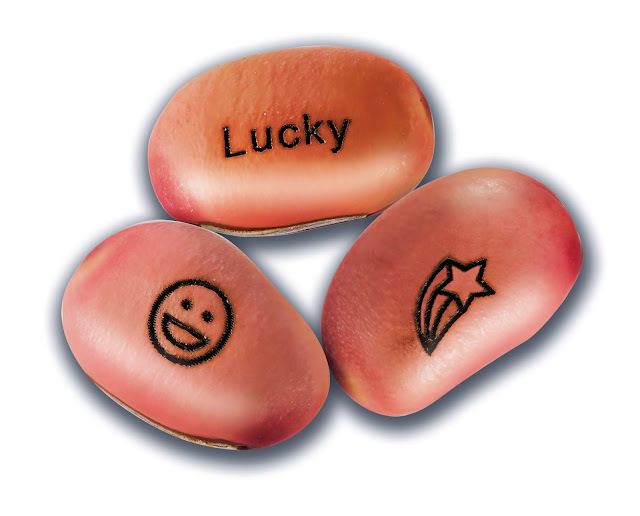 Each bean has a word on one side and a symbol on the other. 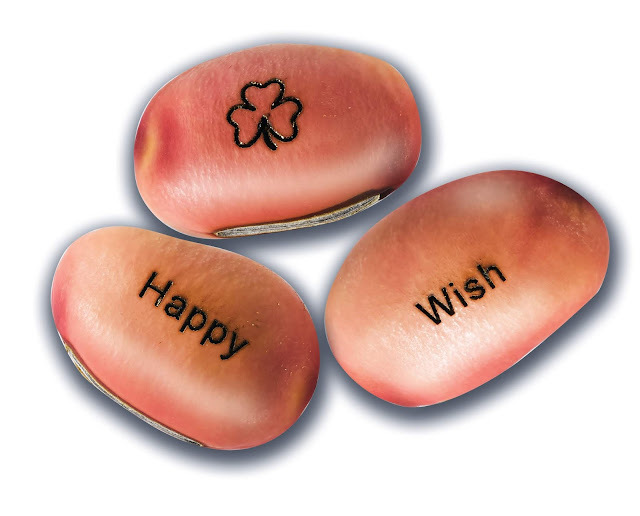 When the plants grow from these beans, those words and symbols will magically appear on the plant. Once your planter is completely dry, fill it with the potting mix. Then plant your beans. Sprinkle your garden stones over the top and add a little water. Then set it aside and wait for the beans to sprout! Once your plants start growing, make sure you water them regularly. But don't give them too much water. Ask your parents for help if you are not sure how much water to give them. They will also need sunlight, so place it on or near a windowsill where the sun shines in. Examine your plants. 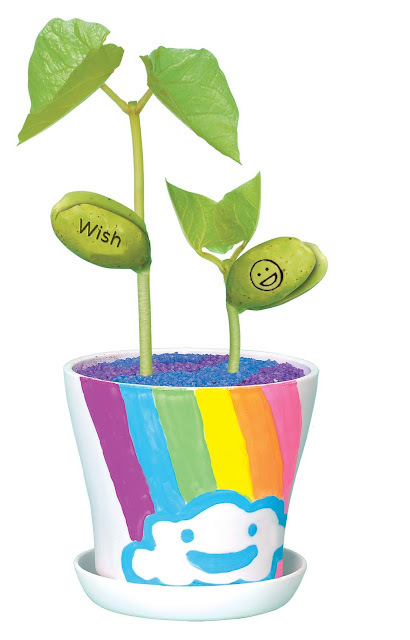 You will see that the words and symbols that were on the beans have magically appeared on your plants! Isn't that cool? The Magic Bean Garden set is recommended for ages 5 to 95. Older children can do this on their own, but younger ones will need their parents' help. You can purchase this on the Faber-Castell website for $14.99. I am an avid fan of all things Coca Cola. 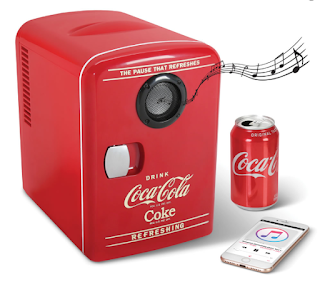 I think this Bluetooth Speaker Coca Cola Refrigerator is one of the coolest things I have seen. It's a fridge, it's a bluetooth speaker and it works in your home or in your car! Dad can upgrade his man cave with this cool fridge with a speaker. I know all Dads would love this gift. The fridge keeps 6 cans of your favorite beverage cold for your drinking pleasure. This is another one of those great unique gifts from Hammacher Schlemmer. When you buy a gift from Hammacher Schlemmer, you have a have a lifetime guarantee. I don't think any other company offers that. 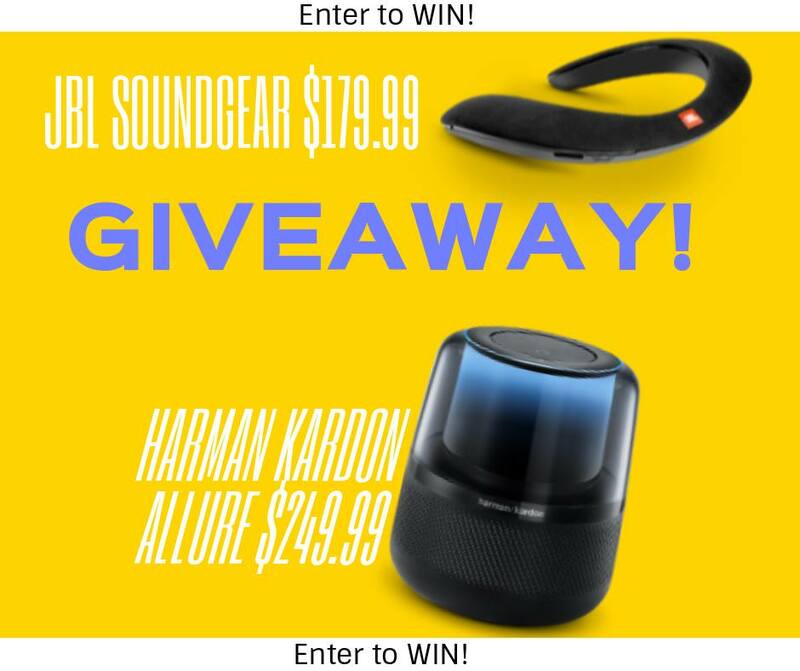 So, it is smart to purchase all of your gifts from Hammacher Schlemmer. 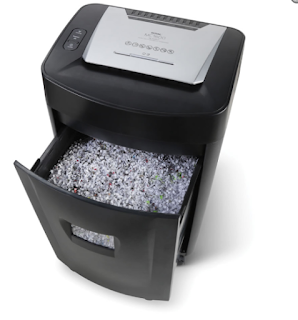 I was excited to get The Best Micro Cut Shredder for my Mother's Day Gift Guide. I am not a huge fan of traditional gifts, I want something I can use. I will be putting this shredder to work, that is for sure. I still get tons of junk mail and other things that have my name and address on it. In these days of identity theft, shredding any document with your information on it is pertinent to keeping your identity safe. While I think flowers are beautiful, I prefer a more useful gift. What are you buying for your Mom on Mother's Day? Need some last minute Easter Basket ideas? I was given these products to review. This is the Animal Jumble 60 Piece Set from Magformers. The set includes 20 additional shapes and animal accessories for hours of fun! There are 8 triangles, 27 squares, 2 pentagons, 2 hexagons, 2 isosceles triangles, 2 trapezoids and 17 clip in animal accessories. 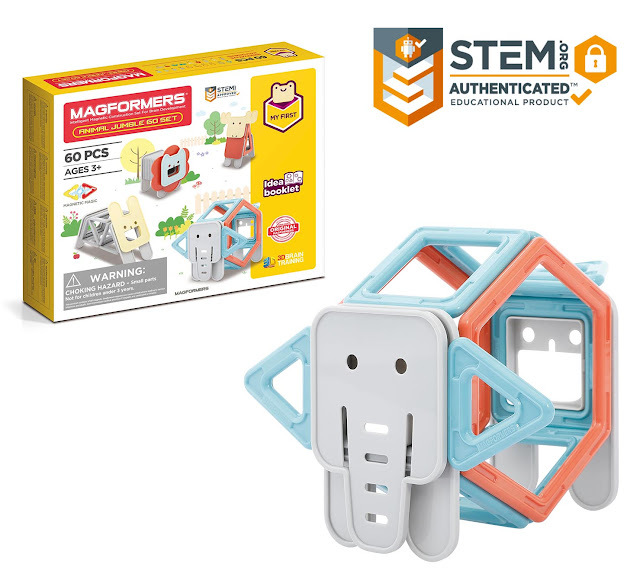 These are compatible with all other magformers shapes and accessories. They are guaranteed to connect thanks to the neodymium rare earth magnets and are made of BPA free plastic. It encourages STEM learning and inspires your child to use his imagination. The magnets help make cleanup and storage easy as well because you can neatly stack them to take up less room. An added bonus is the fact that your child will actually enjoy stacking them! I love watching my kids play with this. They come up with some of the funniest animal combinations. This would make a wonderful alternative to candy for a last minute Easter gift. Recommended for ages 3 and up. The suggested retail price is $59.99. This is the Ooze Labs Slime by Thames & Kosmos. This is another toy that encourages STEM learning and would make an awesome Easter Basket filler. Each container is a big plastic test tube that allows your child to make slime that is safe to create and play with. All kids love slime, right? I know mine do! Creating the slime is a simple and basic lesson in chemistry. 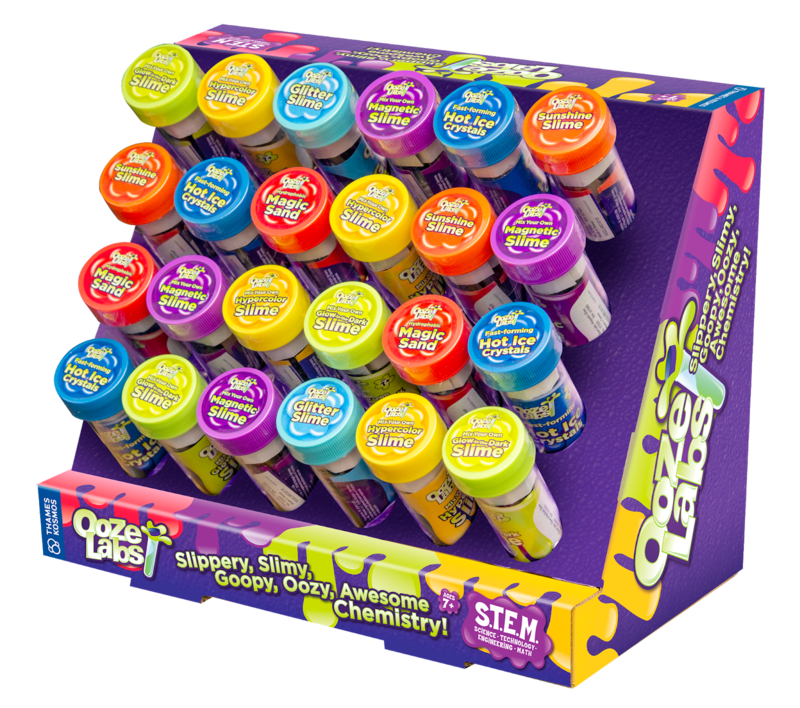 I received the Glitter Slime Ooze Labs, but there are also 6 other varieties which include Magnetic Slime Ooze Labs, Hot Ice Crystals Ooze Labs, Magic Sand Ooze Labs, Hypercolor Slime Ooze Labs, Glow In The Dark Slime Ooze Labs and Sunshine Slime Ooze Labs. All varieties are available on Amazon, at Nordstom and at your local toy school. This is recommended for ages 7 and up. The suggested retail price is $4.95. 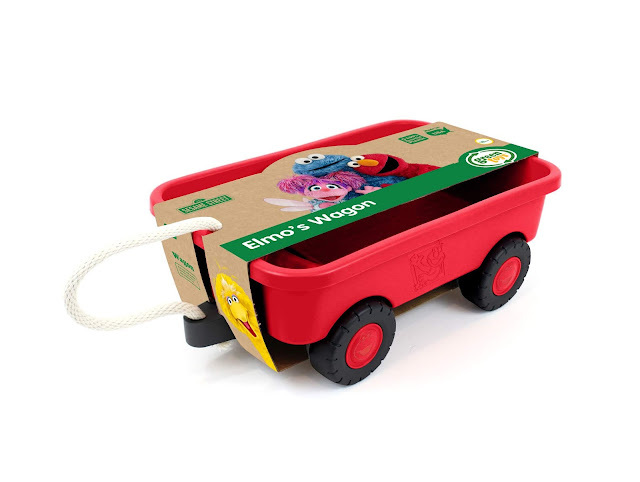 This is Elmo's Wagon by Green Toys. Load it up with all of your favorite things. The wagon is sturdy and durable for indoor and outdoor toddler play. It features fun Elmo faces on each side of the wagon. The 100% cotton rope handle makes it easy for little ones to haul around their most prized possessions. It also tucks away inside for convenient, safe storage. 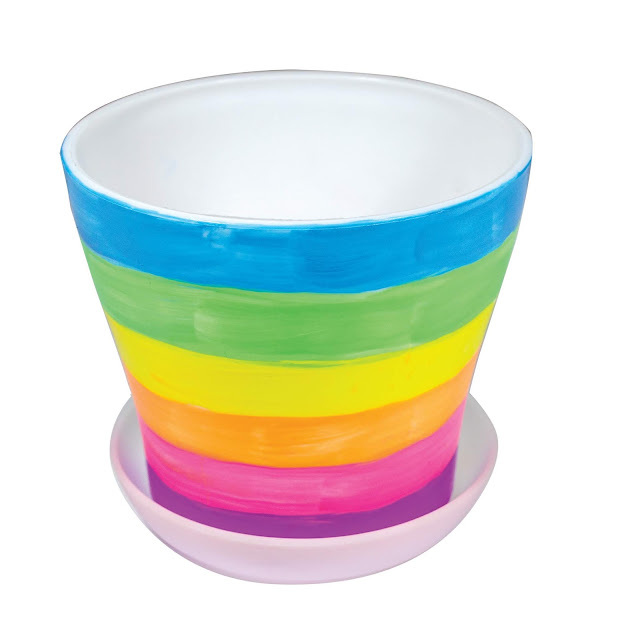 It is made in the USA from 100% recycled plastic with no BPA, phthalates or PVC. It comes packaged with recycled and recyclable materials printed with soy inks. It is recommended for ages 18 months and up. The suggested retail price is $24.99.